On Sunday October 16th I took out Dec Hogan and his wife Amy on the McKenzie for some fall fly fishing for summer run steelhead. They were coming through from Portland while Dec was visiting his mother, and they were on the way to the Redwoods in Northern California. Amy told me in the boat how she has always wanted to see the Redwoods; so they decided to go for it and they planned some fishing in the mix. While driving down they planned on fishing with me on the McKenzie, and then off to the Trinity River to fish down there for steelhead the next day. What a fun sounding trip, and I was involved in Dec and Amy's game plan (how cool!). 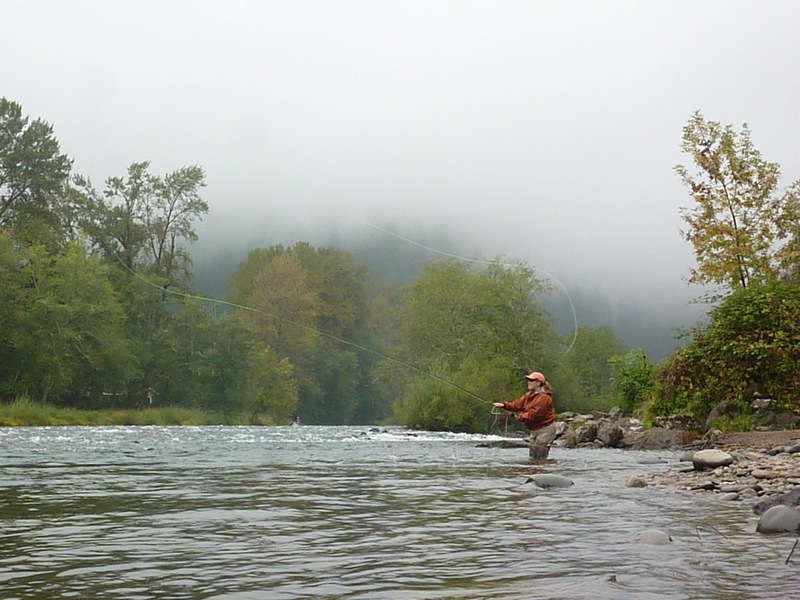 The fishing was red hot on the McKenzie the week before, but fishing fell down to "fair to good" status with hanging high pressure weather and low summer levels flowing in the river. Well you can't catch them unless your fly probing in the water for a likely steelhead, and fall is the best time for aggressive fish. We started out early in the morning, and we were all alone for the first couple of hours on the water. It was a Sunday morning, and there were not any other anglers out, and my only assumption is that the night game between the Ducks and the Sun Devils caused everyone to put am fishing for steelhead on low priority. That was a plus for us; since we got to fish several spots before anyone was out. The only landed fish of the day came from a spot that we fished before anyone else got to it. It was a nice fish that took a swing egg sucking leech on a floating line. What I was really wanted was to see Dec stick several steelhead, but I had the vibe that it was the kind of steelheading day where you will have to work for each fish. It was not going to be a day where they came to your line, and by day's end you were talking about how "all time" it was. Luckily Dec has done lots of steelheading, and he certainly knows what the sport is all about. He seemed most concerned with Amy getting into a steelhead, and that was going to make his day if she was tight to a chromer. 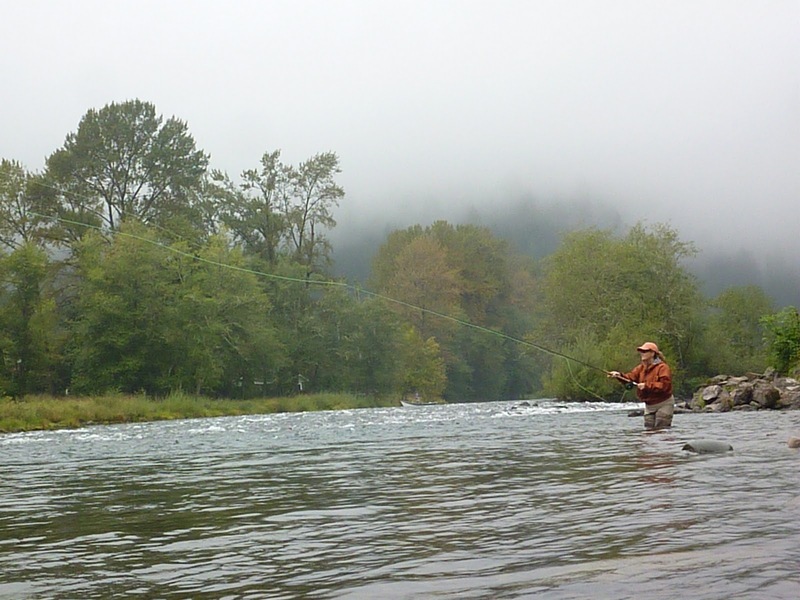 We fished pretty thoroughly, but the fishing session had to be semi short; since they had to head south towards Nor Cal for some Trinity River steelheading, and also to see those giant Redwoods. I was stoked to see the spey casts bombing with grace across the lies of the McKenzie, but I really wanted to see one of their lines yank tight. We fished and fished, and the only sign of success on Dec's part was a fish that boiled on his dry fly. He then switched to a wet fly and went back through the fish's holding area. The fish "snarfed" the fly as Dec stated, but then it long distance released itself back into the river's currents. He was fired up on that take though, and his spark fired me up too. I was fishing hard after the two of them went through the river's probable holding lies. Time was running down for our outing, and we were in the last spot for the session. It was even at the point where I asked Dec and Amy if they needed to take off on their journey to Northern California, and Dec said we'll fish the spot quickly before bailing south. He asked Amy, and she seemed semi indifferent about fishing more, but then she had a spark to get out and swing the run. It turns out that when I walked upstream to start fishing, I noticed Dec running up to Amy, and I thought to myself how Dec really fished to spot fast. I then noticed Amy's rod stapled to the water with a hard bend in it. She had a fish on, and it seemed like a good one. I was about to run down when I noticed the line ripping off her reel, and a chromer catapulting into the air. It was a large bright steelhead rattling in the air several feet off the surface of the water. When the fish landed back into the drink, the line went slack, as the fish ripped to hook out of it's set position. The fish swam off to its new found freedom, and we all looked at each other with wonder and amazement. Dec ran up to Amy and gave her a sweet hug of stoked appreciation. He was totally fired up, and Amy was really charged up too. We all talked about how awesome that fish was, and how amazing of an aerial it did. We decided to then call it a day, and pushed the boat to the take out boat ramp. Dec was stoked on the McKenzie River and its steelhead fishery. He stated how they wanted to come back to fish it again when they had more time. He said how he enjoyed the McKenzie's fishing, and how it was a great day in his opinion; since we all had some steelhead action. I landed a nice fish, and almost could have has another one if it stuck. Dec had one on, but it never quite stuck on the end of the line, and Amy had one hot rocket of a steelhead on also. If everything had stayed on; we all could have went into the boat ramp having landed a steelhead, but that is not the way that fishing goes. That is why it is nice to have people like Dec and Amy that appreciate the fishing and not the catching. I was telling them how much better it can get out there, but they made sure to let me know that they had an amazing time out there; regardless of landing the steelhead that wanted to play. Dec Hogan has a line of wonderful spey rods made by Rajeff Sports called Echo Dec Hogan Spey Rods. He has also written an amazing book called A Passion for Steelhead. He had contributed so many wonderful fly patterns and teaches two handed seminars all around. He is one of the main innovative contributors to modern North American two handed spey casting, and he loves to share every ounce of that with anyone who is interested in it. You need to read his stuff and try out his rods! When I first met Dec Hogan back last spring, he really came off as an amazing person that everyone should have to meet. He is one of those people that is super nice, full of positive energy, and simply wants to help everyone out with anything he possibly can. He also has some really cool fly fishing philosophies, and his steelheading philosophy is totally awesome. He feels that you can fish on your terms, and if the fish wants to come to play on your terms, then that connection is made, and that is what it is all about. That is at least my interpretation of his steelheading philosophy, and when I saw how stoked he was on fishing that Sunday morning; I realized it was totally authentic. We fished on our terms all morning, and we connected with several fish, and only one came to hand. We succeeded since we got some fish to pursue our flies on the lines we chose to fish with. If you think of how awesome it is to have a fish that is not actively eating to gain interest in what you are presenting to it, and then to leave it's holding lie to then eat your fly. That is the hardest part of the task without a doubt! Fishing with Dec and Amy was totally awesome, and I hope to be able to fish with them again sometime soon. Tight Lines!! !